Home >> Generated from JAN's SOAR Information System on 4/26/2019 4:13:46 AM. Roomy storage beneath the lid for lap top computers, business files, and personal items. Durable plastic clip on the inside of the lid holds books and newspapers open. Adjustable lid tilts forward for reading and writing; lies flat for lap top use and other activities. Tray top recesses securely hold paper clips, cups, cell phones, pens, etc. Made of polyethylene, weighs only 7 lb. and measures 24 x 22 x 3 1/2¨ (61 x 56 x 8.9 cm). 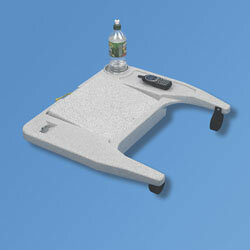 Fits 16 – 20¨ (41 – 51 cm) standard arm style wheelchairs, full or desk length arms. Hook and loop straps steady and secure the tray to the wheelchair.